Pristine national parks, sparkling fjords and incredible wildlife unfold in front of your eyes. 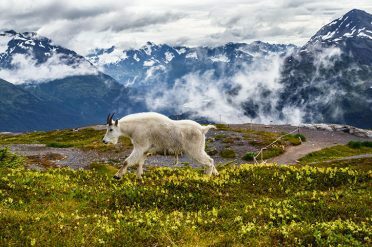 Home to the continent’s tallest peaks and largest glaciers, Alaska is a photographer’s nirvana, full of awe-inspiring sights and challenging experiences. 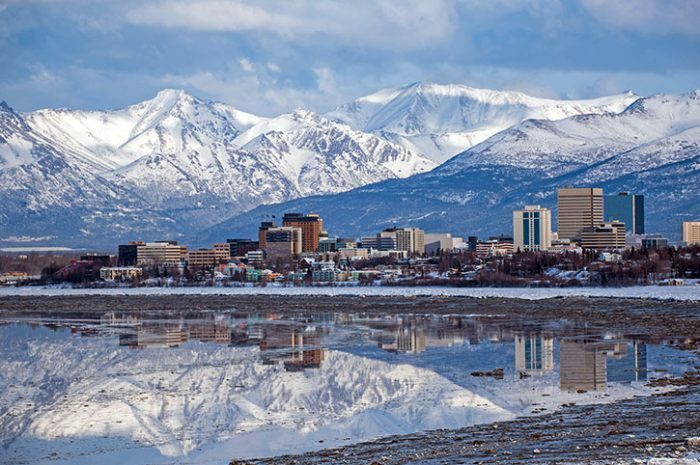 Welcome to Anchorage, the largest city in Alaska, with only 300,000 people. Now a bustling city fuelled by the oil boom and tourism, it wasn’t that long ago that Anchorage was the final outpost before heading into the ‘Last Frontier’. It’s not uncommon to find bears roaming the outskirts of the city – this is one truly wild place. A great way to spend your day is to wander around town getting a feel for the 49th state, speaking to the locals and checking out some of the great cafes and restaurants. A welcome meeting will be held at 18:00 hrs, followed by a welcome dinner to help you get to know your tour leader and fellow travelling companions. The Kenai Peninsula is like something from a larger-than-life children’s novel. It is staggeringly beautiful and offers wonderful wildlife and bird watching opportunities amidst dramatic fjords and glaciers. 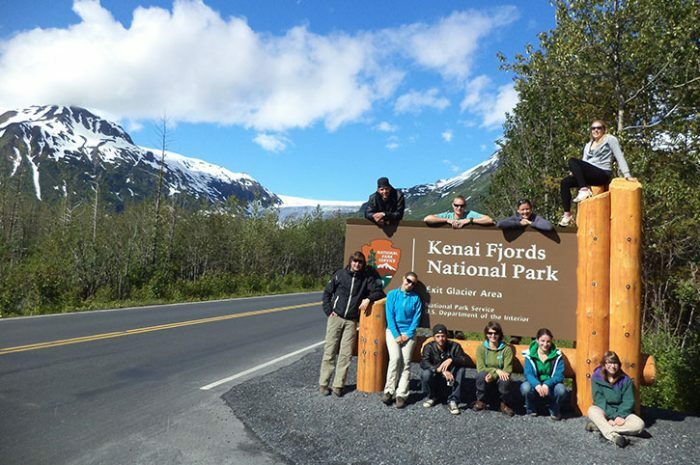 Today you will hike the spectacular trail from Exit Glacier to the Harding Icefield for views of deep crevasses and huge seracs on the glacier. At an elevation of 900m, you will eventually reach a lookout point over the icefield and the views will be out of this world. This has been rated as one of the finest hikes in Alaska. The walk is strenuous and entirely dependent on weather conditions; however, views along the way and especially from the top are simply magical. There’s an easier option available if you prefer, using an accessible trail to reach a different viewpoint of the glacier. For those who want to explore Seward afterwards, the impressive Alaska SeaLife Center, which houses a remarkable public aquarium and ocean wildlife rescue centre, is a fun place to visit. 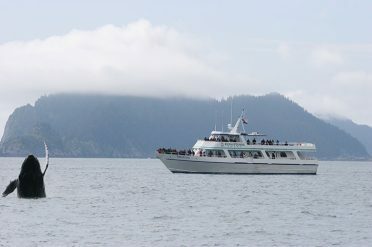 Today you set off on a full day wildlife viewing cruise around Resurrection Bay and the Alaska Maritime National Wildlife Refuge. To maximise your experience on board, your guide will give a detailed commentary on the wildlife you see and the local area. On previous trips, travellers have spotted sea lions, otters, Dall’s Porpoise and an endless variety of seabirds including puffins and eagles. Orcas are often spotted and if you’re lucky, Humpback Whales can be seen! Enjoy a fresh salmon and prime rib lunch on board (included – vegetarian options available). 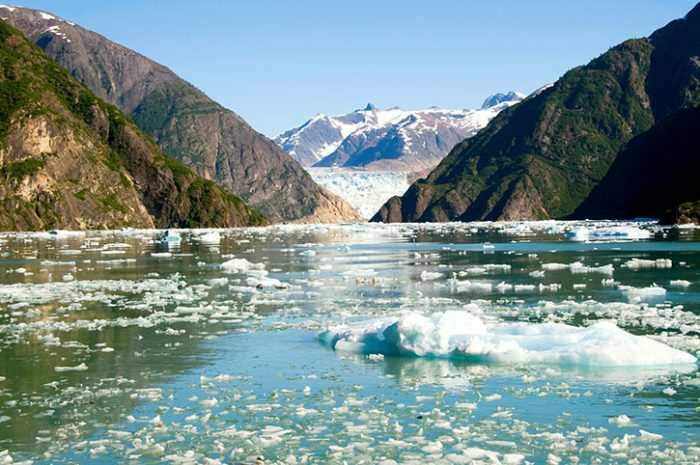 You will also spend time in front of two active tidewater glaciers: Holgate and Aialik Glaciers, so close you can hear them creaking and see chunks of ice fall to the water. From Seward, you make your way towards the city of Homer where you spend the afternoon exploring your new two-night home, and Kachemak Bay, by kayak. 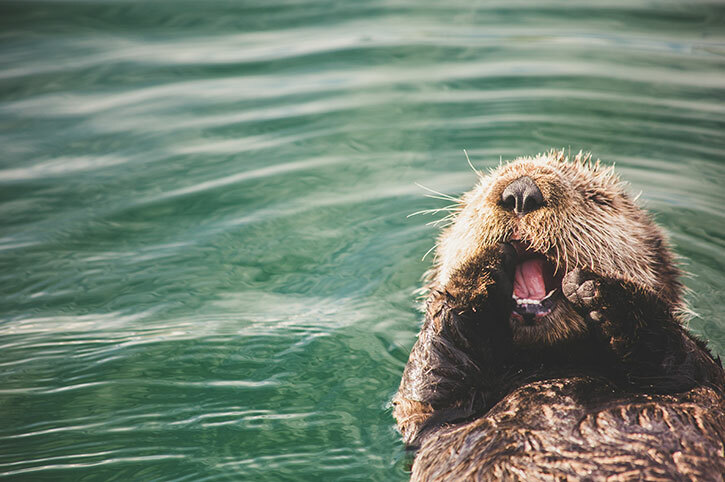 Sea kayaking is a great way to discover the peacefulness of this wilderness area and it is commonplace to spot sea otters and porpoise as well as Bald Eagles circling overhead. With snow-capped mountains and forest as your backdrop, it’s easy to see why people are drawn to Alaska and never leave. It is like nowhere else on planet earth! Today is all about bears and that quintessential Alaskan experience! 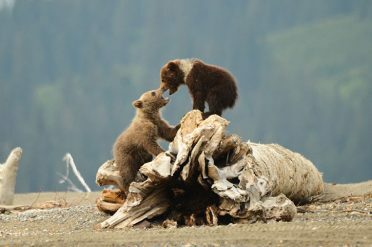 The premier bear viewing fly-in experience is located in Lake Clark National Park and Preserve. This rugged area comprises sleeping volcanoes, ice fields and glaciers and an abundance of wildlife, with lakes and streams teeming with trout and salmon. The bears are drawn to the lake shore where thousands of salmon are spawning in the shallows, which makes it easy for them to capture a meal. And as spawned out salmon die and drift back into the river outlet more bears will travel the riverbank in search of an easy meal. After a 40-minute flight from the sea plane base in Soldotna, you fly past Mount Redoubt and land, where a waiting boat will shuttle you around the lake in search of these magnificent creatures. The viewing opportunities can be non-stop and on previous trips, our customers have spotted up to 20 bears throughout the course of one day. You begin to make your way slowly back to Anchorage today but the fun is not over yet. After driving through the Alaskan wilderness, you’ll stop at Alyeska in the Chugach Mountain Range, ideal for a final wilderness walk before returning to the State’s capital, Anchorage. Beginning with a forest walk and pulley system which takes you over a stream, this eventually leads you to Alyeska Resort which is where you begin the trail. You can also opt to pay for the gondola to the top for beautiful views of snow-capped mountains, wild flowers and your final breaths of Alaskan wilderness before finishing up in Anchorage. 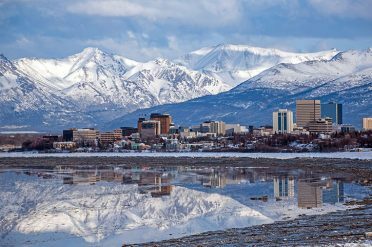 Containing around half the population of the state, Anchorage in some ways looks just like any other sprawling American town and after exploring small towns and villages the bustling streets of the city will feel somewhat different. If you decide to stay on, why not explore the art galleries and craft shops where you can see the beautiful Eskimo handicrafts being made? This tour ends at approximately 17:00 hrs. We recommend booking post-tour accommodation if time allows. If you are planning to fly tonight, please do not book a flight that departs before 21:00 hrs. **Offer – 10% off Small Group Tours on new bookings only until 26th April 2019. Valid for travel until 31st September 2019. Subject to availability, seasonal variations may apply. All prices are per person, based on 2 sharing a twin room, and include meals where shown. Call Freedom Canada for departure dates and availability. Seasonal variations may apply – call or enquire now for more details. Itineraries may vary for tours departing from 1st April 2020 onwards. First class small group touring with the company of others. Our experienced guides will make sure you don’t miss a thing.